Right Angle Sockets suit micro backplane applications. Right Angle SEARAY(TM) Open Pin Field Sockets (SEAF-RA Series) have .050 x .050 in. grid array for maximum grounding and routing flexibility and are optimized to reduce skew and impedance mismatch. They feature Edge Rate(TM) contacts, which are designed for optimal signal integrity, reduced broadside coupling and crosstalk, and high cycles. 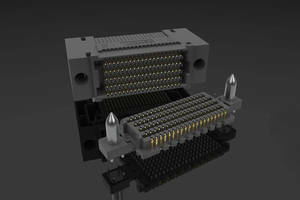 Sockets are available in 4-row (up to 200 contacts) and 6-row (up to 300 contacts) configurations. Samtec has expanded its SEARAY(TM) High Density Open Pin Field Interconnect family with a new line of Right Angle Sockets for perpendicular and high speed micro backplane applications. Right Angle SEARAY(TM) Open Pin Field Sockets (SEAF-RA Series) have a .050" x .050" (1,27mm x 1,27mm) grid array for maximum grounding and routing flexibility and are optimized to reduce skew and impedance mismatch. They feature Samtec's rugged Edge Rate(TM) contacts which are designed for superior signal integrity, reduced broadside coupling and crosstalk, and high cycles. SEARAY(TM) Right Angle Sockets are currently available in four-row (up to 200 contacts) and six-row (up to 300 contacts) configurations. Eight-row (up to 400 contacts) and ten-row designs (up to 500 contacts) along with a Right Angle Terminal (SEAM-RA Series) are in the final stages of development. This system mates with SEARAY(TM) Surface Mount Terminals (SEAM Series), which has optional guide posts for blind mating, and a choice of tin-lead or lead-free solder charged termination. Press-fit tail terminations are currently in development. SEARAY(TM) surface mount systems with up to 500 single-ended or 125 differential I/Os, coax cable assemblies with 180 or 240 I/Os, and high density flex jumpers are also available. Pricing begins at $ .05/per pin in 1000 piece quantities.